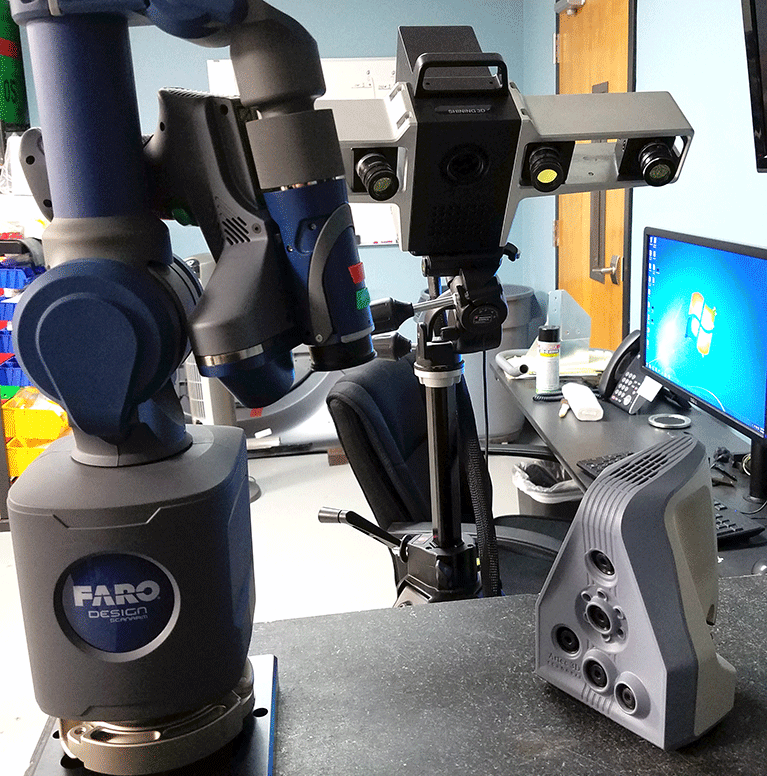 There are a variety of 3D scanning technologies available. What distinguishes each technology is the means by which they measure the distance to points in their field of view. Each technology has its own strengths and weaknesses and is best suited to particular applications. Laser 3D scanners are particularly common. They offer reasonable accuracy for general applications and are relatively easy to operate. Most laser scanners measure the distance to points by one of two methods: triangulation and time-of-flight. Triangulation scanners measure distance using basic trigonometry. They consist of a laser and a camera. 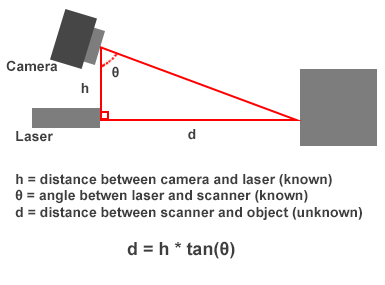 The camera, the laser emitter and the point where the laser strikes the object’s surface form a triangle. The distance between the camera and the emitter is known, as are the angle of the camera and emitter. These known values allow the scanner to calculate the distance to the dot. We’ve referred to a single triangle for the sake of simplicity, but in reality most scanners emit a laser line rather than a point. This allows them to measure an entire cross section of an object at once. And by continually moving the laser line down the face of the part, the scanner can capture the entire surface facing it. Time of flight scanners are essentially laser range finders operated via automation. They measure distance to an object or surface by emitting a pulse of laser light and measuring the time it takes for the light to bounce of the surface and return to the sensor. Because the speed of light is a known constant, the flight time can be used to calculate the distance traveled. Unlike triangulation scanners, time-of-flight scanners are only able to measure the distance to one point at a time. The scanner will quickly move the laser in order to measure every point in its field of vision. Most time-of flight scanners are capable of measuring tens of thousands of points per second. These scanners are typically used in surveying and environment scanning. These scanners consist of an LCD projector and an array of cameras. 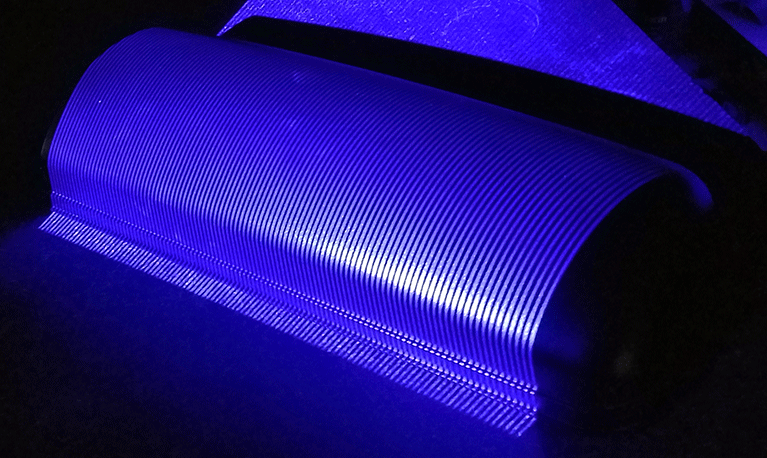 A pattern of light (alternating dark and light horizontal stripes for example) is projected onto the object. The object’s geometry is captured by observing how the pattern has been deformed at each point in the camera’s field of view. For increased accuracy, this process will be performed a number of times with different patterns for each scan. The object is then rotated within the scanner’s field of view and a second scan is taken. The second scan is automatically aligned to the first and this process continues until the entire object has been captured. Compared to laser scanners, structured light offers significant improvements in both speed and accuracy. And because structured light takes individual scans very quickly, it is less susceptible to inaccuracies due to environmental disturbances. Photogrammetry uses computer vision algorithms to reproduce geometry from a series of photos. A large number of photographs are taken, usually with some overlap in between, and the algorithm calculates the geometry based on changes from one photo to the next. In some photogrammetry setups, multiple cameras are used, allowing all of the photos to be taken at once. The primary advantage that photogrammetry has is accessibility. All that’s required is a camera, a computer and the correct software. There are even a number of open source software packages available. The downside is that photogrammetry is not particularly accurate most of the time. Besides its common medical applications, computed tomography (CT) has applications in industrial 3D scanning. Just like their medical counterparts, CT scanners generate a large number of two-dimensional X-ray images. When stacked on top of each other, these images create a three-dimensional model of your part. Unlike other 3D scanning technologies, part must be places inside of a CT scanner. This makes CT scanners more restrictive with regard to the size of the parts that can be scanned. However one major benefit of CT scanners is that they scan both exterior and interior geometry, not just the surface facing them. CT scanner also offer some of the best scan resolution available, but they are the most expensive scanning technology by far. Here at 3 Space we offer 3D scanning services, including laser, structured light and CT scanning technologies. For the majority of our customers’ parts we use either structured light or laser scanning, depending on the situation. They both offer high accuracy at a reasonable price. For very small parts, around 1 inch in diameter or less, we typically recommend CT scanning. The two 3D scanning applications that most of our customers require are reverse engineering and part inspection. Reverse engineering is the process of turning a physical part into a usable CAD model, such as a STEP or IGES file. We 3D scan their part, which produces a point cloud, and use specialized software to recreate the CAD from the point cloud. This is great for digitizing handmade parts or parts that predate CAD. 3D scanning can also be used as a quality control solution. We can 3D scan production parts, align the scan to the original CAD and identify any deviations between the two. This process can be used to troubleshoot any production problems or just to comply with your own internal QA/QC processes. Contact us today to get a quote for our 3D scanning services.